As one of the largest repossession management firms in the country, we work with most of the largest auto lenders in the country. Doing so has given us deep insight into the strategies deployed by different lenders. With many leading lenders, this strategy has been highly refined over the years and is constantly being tweaked in order to maximize vehicle repossession results. With others, the strategy is clearly lacking and the overall results reflect it. Multiple Vendors – Depending on the volume of your institution’s repo activity, the optimal number of vendors seems to be 3-4. Some lenders have figured out that then need enough to create real competition but few enough to make their business really important to the vendors. Assignment Duration – This is probably the single biggest mistake that we see lenders make. They leave assignments with their agents or forwarders/skip companies too long. The reality is that after a certain period of time, the vendor is likely putting very little effort into the case. If your agents/vendors have not found the vehicle in this period of time, the chances are they will not ever find it. More and more lenders are combining this approach with an LPR staging strategy whereby all assignments are put into one or more LPR systems and remain there throughout the rotation process. See the chart at the end of this post for a best practice illustration. Published at least monthly – we have one client that publishes it every day. You bet we watch it closely. Transparent – the methodology is fully disclosed. This level of understanding allows your partners to adjust their strategies to maximize the results you want. Batch Focused – measuring performance on closed (or almost closed) monthly batches gives the best insights into ultimate performance. Anything less really just gives you a snapshot of performance. Rewards/Penalties – Nothing motivates a vendor more than the opportunity to gain or lose meaningful market share based on performance. Frankly, that is all the motivation that we need to really focus on your business. The smartest lenders have really figured this out. They reallocate market share at least once per quarter and the top 1-2 performers get the lion’s share of the business. Being rewarded with an additional couple of percentage points of market really does not create the level of motivation that will maximize results. Of course, the impact of these tactics varies based on how they are deployed, but the impact can be very significant. Below is a simple case study from one of our clients. Their original strategy was to assign to a forwarder at approx. day 60 of delinquency and leave it with that forwarder until charge off (approx. 120 days delinquent). They then changed the strategy to rotate it as a skip assignment at day 90. The difference in results was significant (over $4.0MM in net auction proceeds per year). Now all of this opportunity does come at a cost. Taking full advantage afforded by strategy consisting of these practices will require resources to manage and some system changes may be required. However, the results are well worth it. 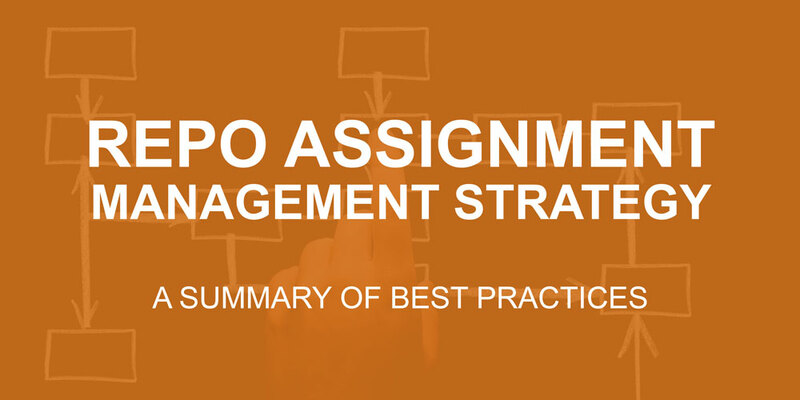 Get a free comprehensive illustration of the best Repo Assignment Management Strategy. 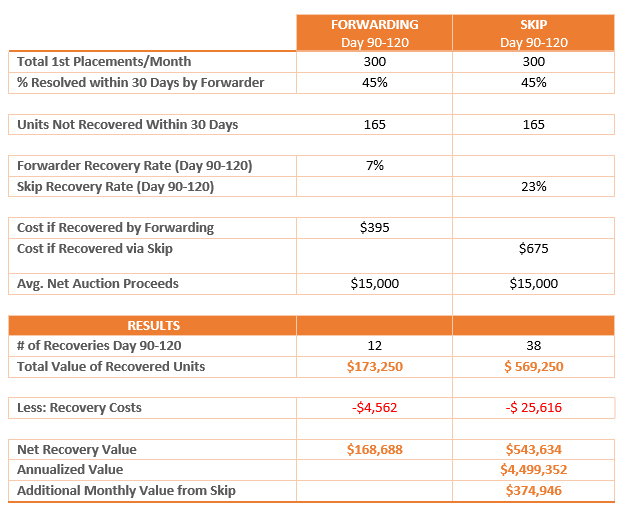 The illustration shows the duration and length of each assignment cycle to further help lenders maximize recovery rates.